Last night I stared up at the ceiling searching for words to say. To battle the brokenness inside I began to silently list praises of thanksgiving. So many questions lingered in my mind but I hesitated to present them to my Father. My mind was not still. My anxious heart was pounding as my chest lifted up with a heavy sigh. The sweet small voice of my favorite 3 year old broke the silence. I looked over to see that he is staring up at the ceiling with his big brown eyes. Illuminated by the night light I could see a smile, and his eyes sparkled despite the darkness in the room. 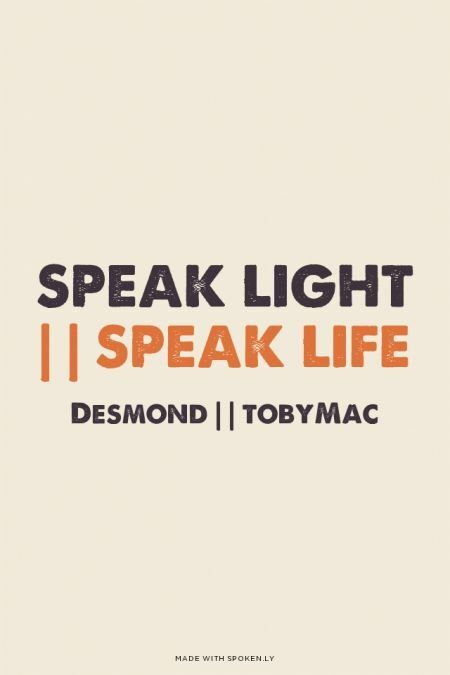 He was singing beyond the ceiling and I was so thankful for his song—I did not correct him for his errors—I’m sure tobyMac would be forgive him for thinking that “speak life” is “speak light”—he might even be okay with him singing the last line of the hokey pokey at the end for emphasis. Desmond’s lyrics were helpful in easing my concerns, in fact, I’d identify them as an example of “perfected praise”. 2 different Bible studies I’ve attended this past month have spoken about “speaking life” into your relationships. This has really helped reveal how I have been delivered from my past. As I move forward I pray for wisdom, seek truth, and speak light/life into my future. What a beautiful moment and write Jenna. Thank you for sharing – and bringing light into my world!